When Maw Keh was 34 years old, he asked the question so many of us ask ourselves: What am I going to do with the rest of my life? A lieutenant for the Karen National Union (KNU), a rebel group in Burma, Keh had his leg blown off by a landmine while rushing a Burmese Army camp in 1986. He had been fighting the Burmese for 11 years. The Karen, an ethnic minority living in Burma's much-contested Karen State along the Thai border, have been fighting for their independence from the Burmese government, a military dictatorship, for over 60 years. Since no medical care was available in Karen State, Karen soldiers carried Keh to the Nam Ruak River that forms the border between Burma and Thailand, and from there Keh crossed the river by boat. Left in the Mae Sot Hospital in Thailand, Keh met a Frenchman named Arnold Thierry from Handicap International (HI) who was visiting patients. The two began talking, and after a few visits, Thierry invited Keh to work for the NGO. Still plagued with the question of what he would do now as an amputee, Keh decided to take the job and help people similarly affected. 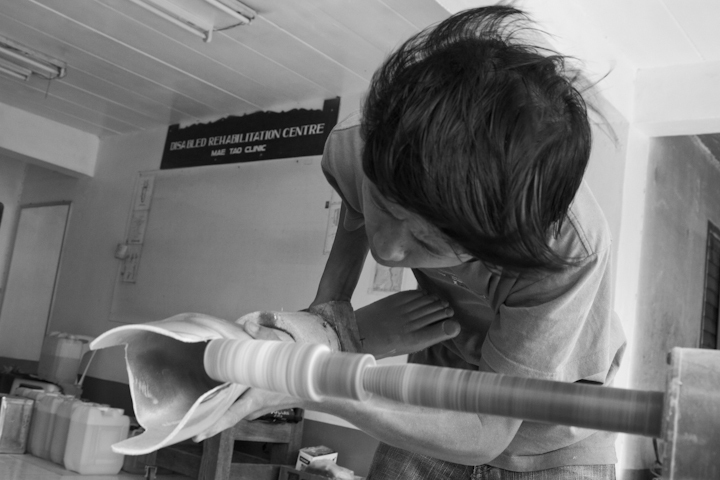 With funding and supplies from HI, Keh opened a prosthetic clinic in 1987 inside the Burma border in Karen State, where its services were badly needed. Since Keh was technically still a Karen rebel, operating in Karen territory, the clinic had to function under the authority of the KNU administration. But when the KNU headquarters fell to the Burmese army in 1994, the clinic was forced to shut down as well. Its patients escaped across the border into Thailand, where they entered the bamboo huts serving as refugee camps along the border. Keh tried to reopen the clinic at different sites in Karen State, but the Burmese army found and destroyed each location. In 2000, Keh opened the clinic in an internally displaced persons camp inside Burma. When the Burmese military found it, they burned down the entire refugee camp. Keh finally decided that it was not safe to continue working in Burma. It wasn't until 2000 that Keh was able to re-open his clinic at the Mae Tao Clinic, a complex of medical units in Thailand serving primarily Burmese refugees. Keh became the director of the prosthetics unit, a position he still holds today. Keh not only treats patients, but also trains some to become technicians at the clinic. As a result, approximately 75 percent of the technicians who work at the clinic are landmine victims and amputees themselves, giving them a special understanding of how to make prosthetic limbs that are comfortable in practice, not just in theory. Most importantly, they realize that their patients still need to work, and often the only available jobs involve doing physical labor on farms, so they must have prosthetic parts that will allow them to do so. Karen State is a hilly, remote jungle, making landmines a particularly effective weapon in this guerrilla conflict. Karen rebels use bamboo-encased landmines to keep the Burmese military from entering their territory, while the Burmese military uses more expensive Chinese landmines both defensively and offensively, planting them in both rebel and civilian areas. 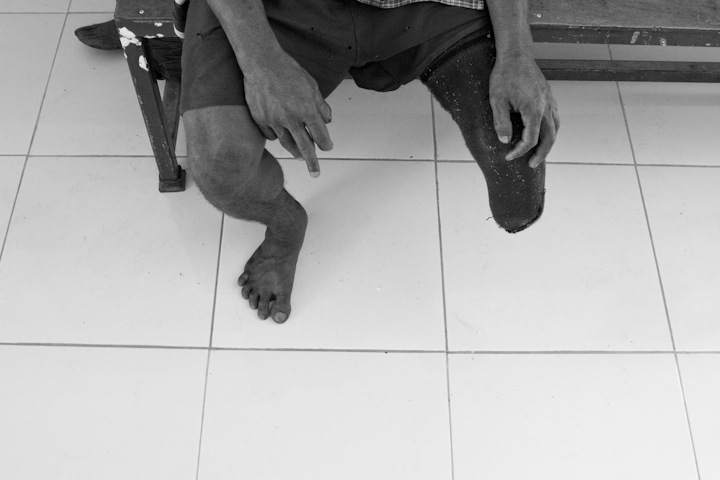 These landmines last for decades and require special equipment to detect, which the Burmese do not have. As a result, large swaths of land in Burma are littered with them. Many people from Karen state escape from the heavy fighting by crossing into Thailand on foot or by boat, legally or illegally. UN-sanction refugee camps, refugee-run schools and 'underground' clinics line the border. The Mae Tao Clinic, where Keh works, is one of these clinics. The Mae Tao Clinic offers free medical care, from malaria treatment to surgery to trauma counseling, to anyone who steps through its concrete walls. A patient is not asked which armed faction he is with. Most initially claim to be civilians, but even if the technicians are aware of a patient's affiliation, it doesn't make a difference. Both Burmese soldiers and Karen rebels are treated the same way, and often lie in adjacent beds. "When a patient confesses he is actually a Burmese soldier, it's not a problem. We still provide everything they need," Keh said. Keh's outlook on the conflict has changed since he began working at the clinic. "We are all human. We are not on the battlefield anymore. On the battlefield, we didn't know each other. We had to shoot -- if you don't shoot, they're going to shoot you. But at the clinic they become visible, and we are visible too." Photos by Arthur Nazaryan. To see more photos of the prosthesis clinic, click here.